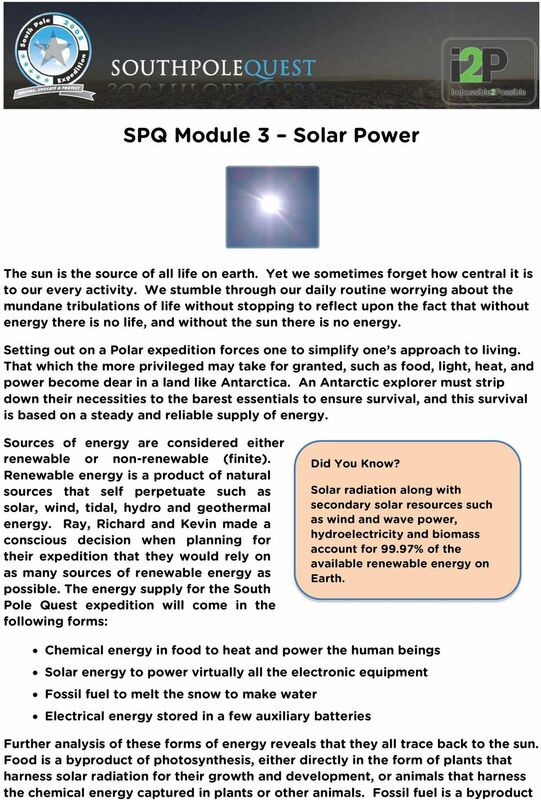 Download "SPQ Module 3 Solar Power"
2 of ancient plants and organisms (hence the name fossil fuel) that have been buried and compressed for millions of years. These organisms harnessed sunlight to grow and multiply. The batteries that store electrical energy are manufactured in factories that either use fossil fuel, or electrical energy from hydroelectric plants. Hydroelectric energy is a product of the flow of water, which results from the climate driven water cycle powered by the radiant energy from the sun. Lastly the solar equipment carried on the expedition directly harnesses the sun s rays and converts it into electrical energy. 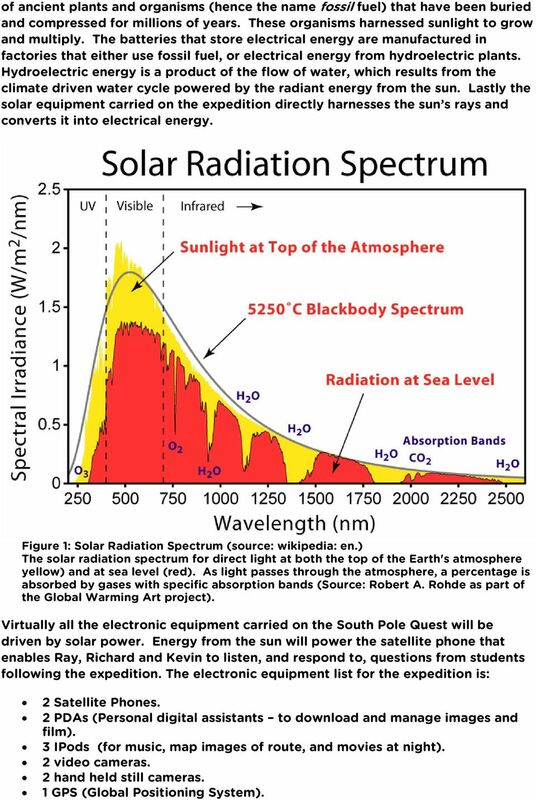 Figure 1: Solar Radiation Spectrum (source: wikipedia: en.) The solar radiation spectrum for direct light at both the top of the Earth's atmosphere yellow) and at sea level (red). As light passes through the atmosphere, a percentage is absorbed by gases with specific absorption bands (Source: Robert A. Rohde as part of the Global Warming Art project). 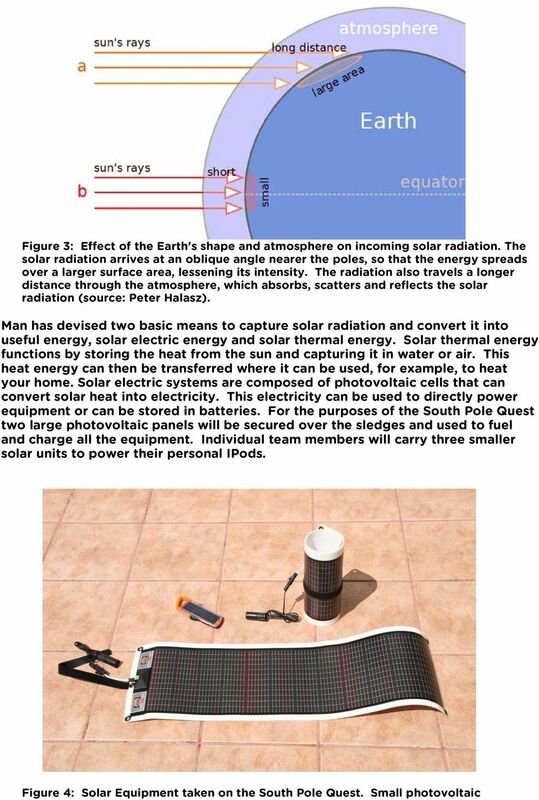 Virtually all the electronic equipment carried on the South Pole Quest will be driven by solar power. Energy from the sun will power the satellite phone that enables Ray, Richard and Kevin to listen, and respond to, questions from students following the expedition. The electronic equipment list for the expedition is: 2 Satellite Phones. 2 PDAs (Personal digital assistants to download and manage images and film). 3 IPods (for music, map images of route, and movies at night). 2 video cameras. 2 hand held still cameras. 1 GPS (Global Positioning System). 3 1 large back up battery that is rechargeable from the solar panels. 2 roll out solar panels (10 and 20 watts) to go on sledges when traveling for recharging all equipment. 3 small solar chargers to wear on backpack to run IPods continuously. 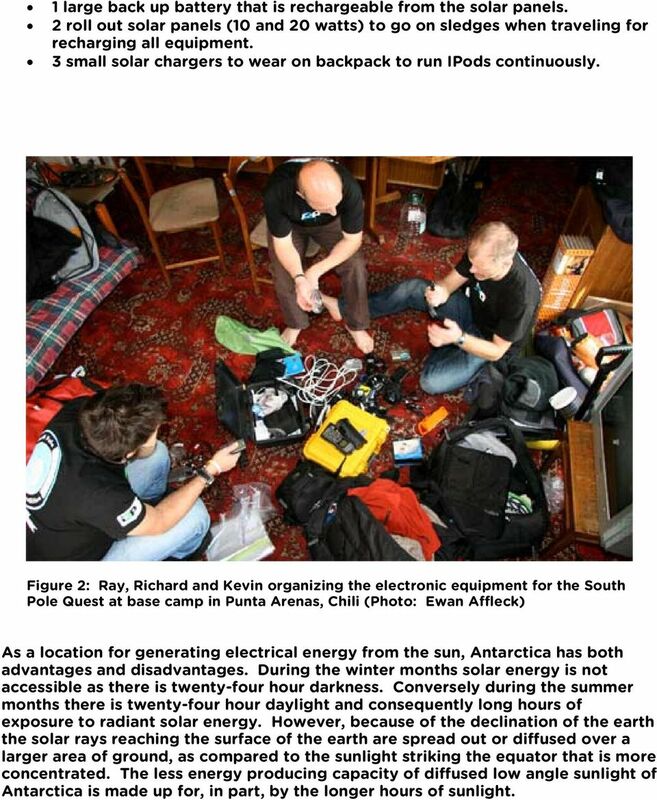 Figure 2: Ray, Richard and Kevin organizing the electronic equipment for the South Pole Quest at base camp in Punta Arenas, Chili (Photo: Ewan Affleck) As a location for generating electrical energy from the sun, Antarctica has both advantages and disadvantages. During the winter months solar energy is not accessible as there is twenty-four hour darkness. Conversely during the summer months there is twenty-four hour daylight and consequently long hours of exposure to radiant solar energy. However, because of the declination of the earth the solar rays reaching the surface of the earth are spread out or diffused over a larger area of ground, as compared to the sunlight striking the equator that is more concentrated. The less energy producing capacity of diffused low angle sunlight of Antarctica is made up for, in part, by the longer hours of sunlight. 5 panel (in orange) for charging IPod, and two larger flexible photovoltaic panels (One rolled up) for charging general equipment (photo: Ewan Affleck) Photovoltaic cells function by trapping the thermal energy of the sun in semiconducting substances like silicone. A semiconductor is a solid material that can conduct electricity. Electrons are knocked off their atoms in the semiconductor by the thermal energy of the sun, allowing them to flow through the material in the form of electricity. This process is known as the photovoltaic effect. Explorers in Scott and Amundsen s time who set out on a Polar expedition were completely cut off from civilization. If one of the team members became ill they had no means of procuring help. Today, with the help of relatively simple technology, Ray, Richard and Kevin can use the power of the sun to call for help, answer questions from students or touch base with their loved ones at home. Did You Know? The energy from just 20 days of sunshine is the equivalent to all the energy stored in Earth's reserves of coal, oil, and natural gas? Smartboard Jeopardy. Energy Jeopardy June 12, L. Harvey Almarode Instructor almarolh.googlepages.com.